DESPITE an abundance of water filters in the market, access to safe drinking water remains a challenge for India and other developing countries. According to WHO, “Every year there are 2 million diarrhoeal deaths related to unsafe water, sanitation, and hygiene. 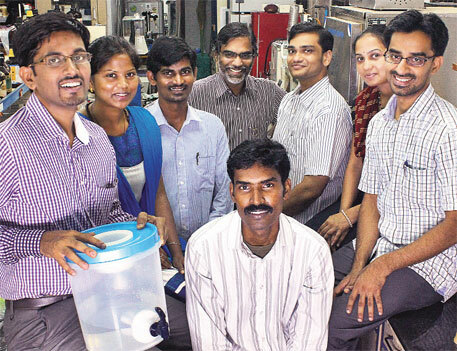 The vast majority of them are children under five.” IIT Chennai researchers have invented a cheap water filter, which they claim could be helpful in achieving the United Nati ons millennium development goal of sustainable access to safe drinking water. The filter, described in PNAS on May 6, uses nanomaterial to remove diseasecausing microorganisms and toxic heavy metals from water. It works by constantly releasing silver ions, which are an effective disinfectant, into the water. Several silver-based anti-microbial devices have been designed in the past but have not been viable. One of the reasons being presence of organic and inorganic impurities in water that cling onto nanoparticle surface and hamper sustained release of silver, say the researchers. However, Ashok Gadgil, division director and faculty senior scientist at Environmental Energy Technologies Division of Lawrence Berkeley National Laboratory in the US says, “The arsenic removal in the PNAS paper was reportedly tested in arsenic-spiked tap-water. In our experience, Indian tap water has pretty low phosphate ion concentration. However, these ions appear in high concentrations in groundwater and compete for the same sites that are intended to capture and remove arsenic.” So, the performance and affordability of the system for removing arsenic from real groundwater would be different from that with spiked tap-water, and those results are not presented in the paper. Another issue left unexplored in the study is the fate of the arsenic-laden sludge formed after rem oving arsenic from water, adds Gadgil. Congratulations for the feat!! I would request the author /associated team to put a you-tube video showing the mechanism related to this filter and how this technology is unique. I hope that would help readers like me to understand it better, appreciate it further. It is really an important development in the field of Stand Alone Water Filter. However, I would like to know about its efficacy with water having high turbidity and ground water having high iron content. Is there any scope of impacts like, clogging of filter media due to turbid water and more specifically due to ferric iron content? Is there also the backwash facility? Moreover, what might be the life of such filter media for releasing the Silver Ion in case of raw water with different quality perspectives, like Alkalinity, Hardness, TDS etc. So I would be more interested for using the same in different parts of Assam to tackle water quality related issues with special emphasis on Iron content of groundwater. While appreciating the enthusiasm of youngsters in designing a filter to remove arsenic using nano technology, I want to place on record there were several efforts on water purification in the past which involved high technology. But nothing beats heating water. There were sari filter which was given wide publicity. Developed for use in Bangladesh, the cloth filter is a simple and cost-effectiveappropriate technology method for reducing the contamination of drinking water. Water collected in this way has a greatly reduced pathogen count - though it will not necessarily be perfectly safe, it is an improvement for poor people with limited options. The cloth is effective because most pathogens are attached to particles and plankton, particularly a type of zooplankton calledcopepods, within the water. By passing the water through an effective filter, most cholera bacteria and other pathogens are removed. It has been demonstrated to greatly reduce cholera infections in poor villages where disinfectants and fuel for boiling are difficult to get. An old cotton sari, folded, creates a smaller effective mesh size (approximately 20-â•¬â•m). This should be small enough to remove all zooplankton, most phytoplankton, and thus a large proportion of the cholera in the water (99%, according to laboratory studies). However, the nylon net with the larger mesh size was found to be "almost equally effective." The cloth filter provides less than ideal purification on its own - usually filtering is an initial step, to be followed by further disinfection. However, where there are no other options, water professionals may consider that it is "of course, better than nothing"
In these methods as well as Brass Vessel method the draw back is certain bactyeria are heat sensitive. Unless thermal energy used,you canÃ”Ã‡Ã–t get safe drinking water. I designed a low-cost solar disinfection gasdget which uses Solar Thermal and UV. It is cost effective and can be fabricated locally. Treatment to control waterborne microbial contaminants by exposure to sunlight in clear vessels that allows the combined germicidal effects of both UV radiation and heat has been developed and put into practice .The SODIS system(Solar Disinfection of water) developed by scientists at the Swiss Federal Agency for Environmental Science and Technology(EAWAG) recommends placing PET bottles (usually discarded mineral water/beverage bottles) painted black on one side, aerating (oxygenating) the water by vigorous shaking three fourths water filled bottles and then filling them full and placing them in sunlight for 6 hours. In this method, the water is exposed to UV radiation in sunlight, primarily UV-A and it becomes heated; both effects contribute to the inactivation of water borne microbes. The use of PET bottles requires periodic replacement because of scratches and they become deformed if temperature exceeds 650C. Also dust accumulates on these bottles in the groves (provided for strength). The PET bottle mineral water manufacturers print on the label, Ã”Ã‡Ã¿crush the bottle after useÃ”Ã‡Ã– in India. Unless cleaned thoroughly everyday, PET bottles turn brown over usage rendering lesser transmission of sunlight. Microorganisms are heat sensitive. Table 1 lists up the required temperature to eliminate microorganisms within 1,6 or 60 minutes. It can be seen that it is not required to boil the water in order to kill 99.9% of the microorganisms. Heating up water to 50 Ã”Ã‡Ã´ 60C (122 Ã”Ã‡Ã´ 140F) for one hour has the same effect. It has been widely experimented and established by earlier researchers that at temperature of 50C (122F), pathogenic microbes are inactivated. The temperatures which cause approximately a 1-log decrease in viability with 1 min are 55C (131F) for protozoan cysts; 60C (140F) for E.coli, enteric bacteria, and rotavirus; and 65C (149F)for hepatitis A virus .Negar Safapour and Robert H.Metcalf in their extensive studies reported enhancement of solar water pasteurization with reflectors and the crucial role of temperature above 50C (122F) in the elimination of pathogens. Suspended particles in the water reduce the penetration of solar radiation into the water and protect microorganisms from being irradiated. Solar disinfection requires relatively clear water with a turbidity less than 30 NTU.To remove turbidity traditional methods of putting the paste from seed of strichnos potatorum (Nirmal seeds) by rubbing the seed on a rough stone with water is used. The method is effective, turbidity settles down in half ofv an hour and the seed are available in plenty in forests in India besides being inexpensive. Water samples from the solar disinfection unit were tested with Most Probable Number (MPN) technique. To estimate the number of aerobic organisms present in water, Pour Plate Technique has been used. The test results of various water samples disinfected are presented in Table 2. In the samples from Ambattur Bore Water, Ambattur Well Water, Anna Nagar Bore Water and Kavaraipettai Bore Water, since they are highly contaminated, further dilutions were not carried out. The dilution should be done only when the MPN indicates more than 1100 organisms/100 ml. For these samples only log reductions can be calculated. As regards R.S.M.Nagar Bore Water and Thathai Manji Well Water, the percentage of reduction are 85 and 86.95, which indicates that the water is less contaminated. As MPN index shows less than 3 organisms for 100 ml, after solar disinfection of water, the samples are free from coli forms. The results of Avadi Waste Water and Perambur Waste Water show 3 log reduction (99.8%) and 4 log reduction (99.993%) respectively. Thanks a lot for your update. However, the facts remains, is that the Chennai IIT Team under the able Leadership of Dr. Pradeep, has developed the 'Arsenic Trap', which can take care of Microbial, Heavy Metal and Organics contaminants through this Stand Alone Water Filter. It does not require any secondary filtration also. Moreover, the unique feature of the same is reported to be the cost involvement @ 6/7 paisa per litre to facilitate microbial and chemically safe drinking water. It is really a remarkable approach / efforts. The only issue may perhaps be the upper limit of Arsenic contamination, which can be treated well in such 'Arsenic Trap'. Another issue might be the safe disposal of the arsenic laden sludge from it and also it's efficiency to get the better of the competition from Phosphate concentration. These issues are raised by Ashoka Gadgil also. I hope, all such issues and it's applicability for all kinds of water with different physico-chemical and microbial properties, will be overcome in a much result oriented approach. The facts referred by you with regards to the 'Cloth Filter' and SODIS Method are also quite relevant to take care of the Microbial Contamination of water. There is no doubt that they are very much effective, especially during emergencies like flood etc. Thanks a lot for referring the traditional methods like using 'Moringa Olifera', 'Tulshi Leaves' etc. More importantly the 'Tulshi Leaves' can very well be utilised to check the presence of Iron in Grounwater also as home based method. Finally, my Best Wishes to such noble endevour from Chennai IIT Team to facilitate us the 'ARSENIC TRAP' with all Success. I would like to know the updates / inputs with regard to the probable challenges, already mentioned in the discussion. I am interested to know about the results from the field level application of such 'Arsenic Trap'. Arsenic is a problem in the public water system here in the states, especially in my hometown. I'd love to see this type of technology become accepted by private and governmental institutions. Our drinking water is what makes us thrive or hinders our health tremendously. This information needs to seen by the majority, as I believe there is a lot of ignorance in regard to drinking water and the affect it has on our health. I have also heard of the method of using Moringa to purify water. How exactly do the composites and nanoparticles work at removing impurities?